Yep, we’re having another! We’ve already got 3 beautiful kids and in some ways, we seem to be getting the hang of this parenting malarkey. We’re certainly getting good at pretending we’re good at it anyway. We’d talked about the idea of having a big family.. well, as you can see, we did more that talk about the idea as the picture above illustrates. Eirene and I got to see little one for the first time today. 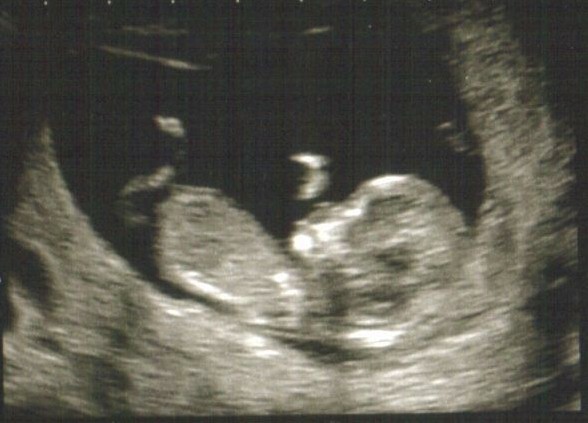 Our twelve week scan. You’d think that with the ‘done it 3 times before’ some of the sparkle of such a magical moment would have faded a little. I can safely say that it hasn’t. Seeing ones own baby, floating in his or her absolute dark bubble of space, is still about the most incredible, miraculous thing I’ve ever seen. Eirene, my wonderful wife is fine and dandy. Glowing and slightly growing. She’s gone off tea and cake but is making up for it with near any other biased towards healthy foodstuff she can get her hands on for most of her waking hours. We’ve discovered baby likes walking as well. Starting somewhere near the exact conception date – since before we knew, Eirene has been getting up for mornings walk with the dog and I. Baby baby baby. Who are you? Love, love, love this – I’m knitting!